John Boyd Baxter was the Procurator Fiscal of Dundee for nearly 57 years. He chaired the Albert Institute Ltd. and was a generous donor to the Institute. He contributed to other local charitable works, including the Free Library and the Infirmary. Greenfield Place, Perth Road, Dundee. Sea-Craig House, Ferry Road, Dundee. Craigtay, 101 Ferry Road, Dundee. Burgess of Dundee by privilege of William Baxter, merchant, burgess of Dundee, his father, 1823. Secretary, Dundee Manufacturers' Association, 1829-1830. Ordinary director, Forfarshire & Perthshire Fire Insurance Co., 1842-1859. Clerk, Dundee and Arbroath Railway Co., 1850-1854. Director, Dundee High School (for the subscribers), 1864-1882. Preses, Faculty of Procurators and Solicitors in Dundee, c.1867-1881. Director, 1867-1868; Chairman, 1869-1879, Albert Institute Ltd. Twice elected President of the General Council of Procurators. Member of the Royal Commission upon the Law Courts in Scotland. Examiner under the Law Agents (Scotland) Act 1873 (which required regular attendance at the quarterly examinations of law students in Edinburgh). Member of the Free Library Committee/Free Library, Museum and Picture Gallery Committee, Albert Institute (from householders), 1871-1879. Procurator Fiscal, Sheriff Court for Dundee District of Forfarshire, 1824-1881. Procurator Fiscal, Burgh or Bailie Court, Dundee, 1842-1881. Elected member, Dundee School Board, 1873-1879. Subscriber no.24 – Mary Anne Baxter was a second cousin. Subscriber no. 70 – Allan Edward was a brother-in-law. Subscriber no. 72 – James Edward was a brother-in-law. Bank Close, Castle Street, Dundee. John Boyd Baxter was educated at the Grammar School of Dundee before undertaking a legal apprenticeship in Dundee, with a view to becoming a solicitor. After completing his apprenticeship he moved to a law firm in Edinburgh and attended Scots Law classes at Edinburgh University from 1815-1816. He returned to Dundee and practised as a law agent. An unsuccessful attempt was made to have him elected as clerk to the Guildry Incorporation of Dundee in 1823 by those opposed to the progressive faction of that body. He was made a burgess immediately afterwards. He was appointed Procurator Fiscal for the Dundee district of Forfarshire in May 1824 and held the post for 57 years. He also acted as Procurator Fiscal for the Burgh Court. For a period he was also part of the firm of Baxter & Malcolm with David Malcolm, writer, Nethergate, Dundee. John Boyd Baxter was the son of William W. Baxter, cousin to Mr William Baxter, the father of the founders of the firm of Baxter Brothers and Co. He was educated at the Grammar School in Dundee. In 1827 he married Margaret Edward, daughter of Alexander Edward, tobacconist. They had one son, John Edward Baxter. 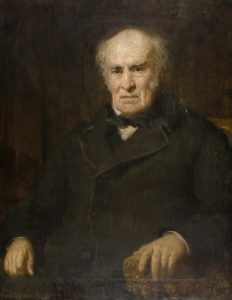 John Boyd Baxter was appointed Procurator Fiscal in May 1824, a post he was to hold until his resignation in March 1881. On 1 February 1874 St Andrews University conferred upon him the degree of LL.D in consideration of his “high legal status and literary gifts.”. On the 4 June 1874, to recognise his 50 years of service, a ceremony was held in the Courthouse building, with representatives from the magistrates and town council. A marble bust by William Brodie was also unveiled and given to the Faculty of Procurators and Solicitors in Dundee for display in its library. He wanted to see a college established in Dundee and made reference to this in his speech during the public commemoration of his 50 years as Procurator Fiscal. Five months later he put the scheme to Dundee Town Council, but divergences of opinion emerged and indeed the University of St Andrews was opposed to the idea and deprecated the idea of Dundee entering into competition with itself. A Royal Commission report in 1878 suggested the establishment of a college in Dundee affiliated to St Andrews but teaching only Medicine and Sciences. On 22 December 1880, six years after he had brought the college question to the town council he brought the same subject before the directors of the High School. This time he offered, on behalf of his friend and cousin, Mary Ann Baxter, and himself, the sum of £125,000. He did not live to see the foundation stone laid, but a beginning had been made, with Mary Anne Baxter increasing her contribution to £130,000 and John Boyd Baxter increasing his to £10,000. Altogether £35,000 had been spent on the purchase of a site and fitting out the building as classrooms. A deed of endowment and trust had been executed and as soon as a principal and professors had been appointed, the work proper of University College, Dundee could commence. The first students enrolled in 1883. However, the Royal Commission had rejected the Albert Institute plan for the “unbroken circle of literature and science” to be available in Dundee, which was central to the deed of endowment. It was stated clearly that the endowment was for the “founding, establishing, endowing, maintaining and conducting a college for promoting the education of persons of both sexes and the study of science, literature and fine arts”. As chairman of the Albert Institute company he asked the shareholders to transfer their interest in the Albert Institute buildings to the town council for the nominal sum of £1,000. This allowed the whole structure to be in the hands of the town council, for the benefit of the people of Dundee under the terms of the Public Libraries (Scotland) Act, 1854. 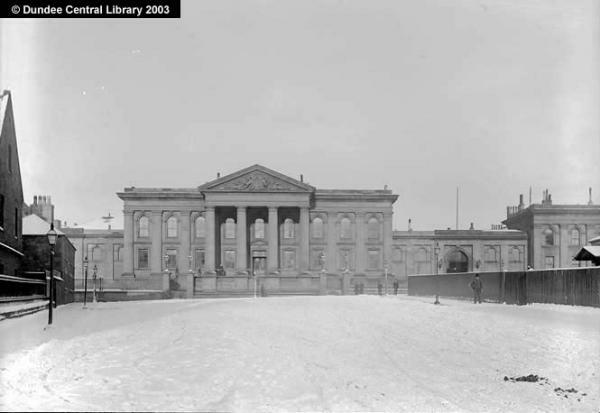 After the Albert Institute company had been finally wound up he was able to return, in the name of the shareholders, the sum of £280 for the purpose of increasing the number of volumes in the reference department of the Free Library. In honour of his overwhelming generosity in handing over the rooms within the Albert Institute, to which his company had a proprietorial claim, on the 9 September 1881, he was presented with his portrait, painted by Sir Daniel MacNee, president of the Royal Scottish Academy. During his acceptance speech he spoke of the increase in material prosperity in Dundee after the fall of Napoleon, but regretted that the provision of means for mental improvement did not keep pace with the accumulation of wealth and the progress of the town. The portrait was presented by Dr. Baxter to the Provost for the Albert Institute’s picture collection. He resigned as Procurator Fiscal at the end of March 1881. In his will his estate was valued at £71,668 17s. 0d. There were many personal bequests and among the public ones were £1,000 to Dundee High School, £1,000 to Dundee Royal Infirmary and £500 to Dundee Free Library. Millar, A.H. (1887) Roll of Eminent Burgesses of Dundee, 1513-1886. Dundee. Friends of Dundee City Archive website. Old Parish Record. Dundee. Marriage. 11 June 1827. 282/210 214. ScotlandsPeople website. Old Parish Record. Dundee. Baptism. 11 December 1828. 282/160 184. ScotlandsPeople website. Dundee Directory, 1837-38. Local Studies, Central Library, Dundee. Dundee Directories, 1837-1881. Local Studies, Central Library, Dundee and 1881 Census Scotland. Dundee. 282/4 ED4 p.23. ScotlandsPeople website. Statutory Registers. St. Andrew, Dundee. Death. 4 August 1882. 282/4 626. ScotlandsPeople website. Howff Graveyard Burial Records. Friends of Dundee City Archive website. Dundee Directories, 1842-1859. Local Studies, Central Library, Dundee. Dundee Directories, 1864-1881. Local Studies, Central Library, Dundee. Dundee Directories, 1867-1881. Local Studies, Central Library, Dundee. Leng, John & Co. (1883) Dundee Yearbook, 1882. Dundee: John Leng &Co. Local Studies, Central Library, Dundee. Dundee Directories, 1871-1879. Local Studies, Central Library, Dundee. Millar, A.H. (1887) Roll of Eminent Burgesses of Dundee, 1513-1886. Dundee. Friends of Dundee City Archive website and Dundee Directories, 1829-1881. Local Studies, Central Library, Dundee. Dundee Directories, 1842-1881. Local Studies, Central Library, Dundee. Dundee Directories, 1874-1879. Local Studies, Central Library, Dundee. Dundee Directory, 1818. Local Studies, Central Library, Dundee. Dundee Directories, 1829-1838. Local Studies, Central Library, Dundee. Dundee Directories, 1864-81. Local Studies, Central Library, Dundee. Dundee Directories, 1842-1862. Local Studies, Central Library, Dundee. Lamb collection. Local Studies, Central Library, Dundee and Millar, A.H. (1887) Roll of Eminent Burgesses of Dundee, 1513-1886. Dundee. Friends of Dundee City Archive website. Shafe, Michael. (1982) University Education in Dundee, 1881-1981. Dundee: University of Dundee. Archive Services, University of Dundee. Deed of Endowment and Trust of University College, Dundee by Miss Mary Ann Baxter of Balgavies and John Boyd Baxter, Esq. LL.D., Dundee, 1881. UR-SF 11/3/97. Archive Services, University of Dundee. Wills and Testaments. Dundee Sheriff Court. SC45/31/32. ScotlandsPeople website. The information above about John Boyd Baxter has been collated from a range of digital and hard copy sources. To the best of our knowledge it is correct but if you are relying on any information from our website for the purpose of your own research we would advise you to follow up the sources to your own satisfaction. If you are aware of an inaccuracy in our text please do not hesitate to notify us through our Contact page.